Civic Engineers offer a number of paid internship opportunities usually through the summer months to students from across the UK and abroad. These are typically between 6-8 weeks aimed at complementing a student’s studies with practical real life engineering experience. From day one our interns are assigned a line manager and mentor and quickly become an integral part of our team. Each intern is given their own workbook to keep a record of their learning and development during their time with us. This workbook is reviewed regularly with their line manager and provides an opportunity to discuss where further learning opportunities could be gained. Michael Cameron (below) came to us to use the Glasgow Avenues as his case study in his final paper for his MSc in Global Sustainable Cities, a course run by the Institute of Future Cities from the University of Strathclyde. 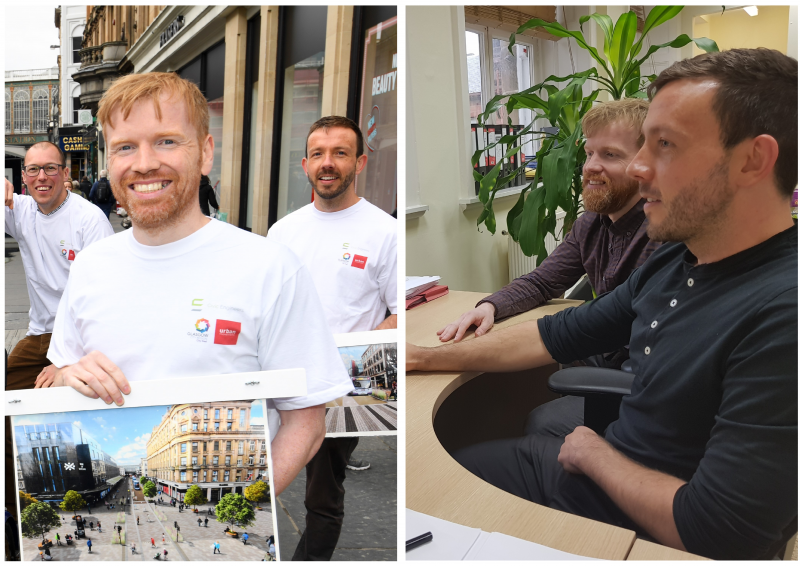 Michael returned to Civic Engineers after his graduation as a paid infrastructure intern working alongside Scott Manning on the Glasgow Avenues project. Above: Scott Manning and Michael Cameron on public consultation for the avenues during Michael’s MSc project and then in the Civic Engineers Glasgow Studio.